Look, They Have Fun, Difficult To Understand Stats In Football Too! It was a happy day at Deadspin World Headquarters yesterday. 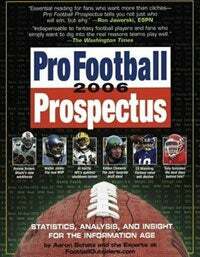 Our copy of Pro Football Prospectus arrived. As with Baseball Prospectus' yearbook in baseball, we never really feel like the season is actually close until we can pore through the Football Outsiders' guide. We'll admit: Some of the statistics confuse us; we just figured out what DVOA means a couple of weeks ago. Up to that point, we thought it was the name of Trey Parker's band. But it's comprehensive, it's exhaustive, it's well-written, it thinks Jeff Garcia might be the worst quarterback in football and it was hatched from a long-time excellent Web site. Nothing but love here, folks. Plus, we finished second in our fantasy league last year and are desperate to get over the hump.